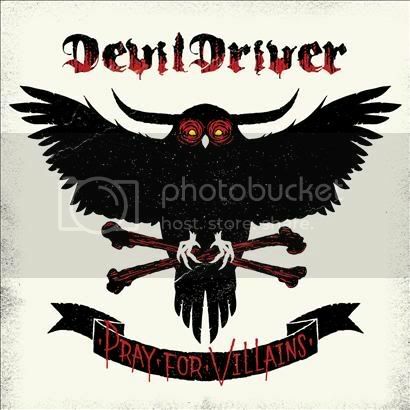 Santa Barbara, California's DEVILDRIVER will release its fourth full-length album, "Pray For Villains", on July 14 via Roadrunner Records. The effort — which will also be made available as a special-edition CD/DVD package featuring three bonus tracks, a behind-the-scenes DVD and expanded artwork — was recorded at Edge of the Earth studios in Los Angeles with producer Logan Mader (FIVE FINGER DEATH PUNCH, GOJIRA, DIVINE HERESY). DEVILDRIVER filmed a video for the title track of the new album on April 9 with director Nathan Cox (QUEENS OF THE STONE AGE, MARILYN MANSON, LINKIN PARK). The "Pray For Villains" track is available for free download at this location (e-mail sign-up required). "The concept of the villain saving the day — when all else fails, you turn your eyes towards the badass that gets the job done. Not the clean-cut guy — often big-talking, slowacting, lacking in spirit and conviction! "I needed something graphic to tie into the hero/villain idea. "I, personally, have been collecting owls for some time and the owl in many different cultures is seen as both the hero and villain. In Ireland, an owl that enters a house must be killed at once, for if it flies away it will takes the luck of the house with it. In Australia, aborigines believe bats represent the souls of men and owls the souls of woman. Owls are therefore sacred in their culture because your sister is an owl and the owl is your sister. For the Aztecs, one of their evil gods wore a screech owl on his head and in the Celtic culture, the owl is the sign of the underworld. 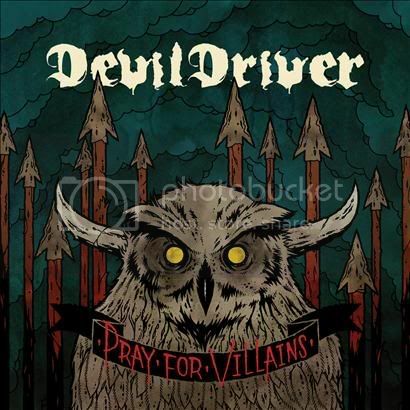 So, the owl was the obvious choice as I wanted to feel as connected to the artwork as I do to the music and also give DEVILDRIVER another icon to work with and even further define us a band!" DEVILDRIVER will headline this summer's "Thrash And Burn Tour", which will kick off on July 22 and run through August 30. A European tour with BEHEMOTH and GOJIRA will follow in October. DEVILDRIVER recently re-signed with Roadrunner Records after previously issuing three full-length albums through the label. In addition, the band has secured a new management company in the shape of Davis Entertainment Group.